This is the final installment in a series on what it takes to get a job in 2010. Whether you're changing careers or entering the workforce for the first time, there are some specific areas that should get your attention as you prepare to begin your job search. Parts 1 and 2 examine the importance of your GPA and getting (and making the most of!) relevant work experience. Read on for one final tip. Develop the most marketable skills. 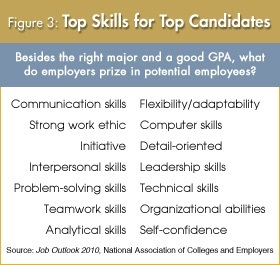 According to the National Association of Colleges and Employers, the skills in the chart to the right are most desirable among employers. Obvious, right? But what isn't so obvious is how to communicate that you have all these skills. No, you shouldn't just list them in the opening line of your cover letter, or rattle them off in an interview. But you should keep them in mind as you craft the message that underscores your letter, resume, and interview. Easier said than done, right? Again, that's where Career Development Services comes in. We can show you the best practices for communicating to a potential employer that you've mastered these skills. And if there's a key skill you're missing, we can provide the workshop that will help develop it. Don't let today's competitive job market intimidate you. Instead, let it inspire you and take the steps that will put you ahead of the pack. It won't be easy, or happen overnight, but the outline I've provided will set you on the course toward your goal: A position with a company that values your dedication, experience, and skill set.